Early evening - 11 after-workers at one table - don't rate their chances as a football team. Mordue - Five Bridge Bitter 3.80 Nice hoppy bite. Wylam - Galatia 3.90 Grown ups lemonade. Fairly quiet on a Wednesday afternoon, such that the landlord offered to bring a beer from the cellar for me to try. Tryst - Dark Toffee Porter 4.40 One of those beers that absolutely lives up to its name. Dark brown with a slight burnt toffee flavour and some sweetness. A little hoppiness in the dryish finish. My score 16/20. Big Lamp - Winter Pale 4.50 Pale golden with a good citrus hop bitterness balanced by some malt. Fairly dry, citrus finish. My score 15/20. Gundog (re-named now see Acton Ales entry) - Golden Cocker 4.10 Golden bitter with a very strong hop bitterness. A little maltiness and a dry, bitter finish. My score 14/20. 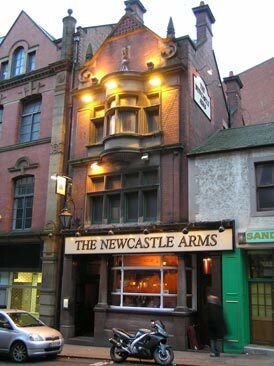 Found some more Newcastle area beer samplers in here. Relaxed atmosphere mid Saturday afternoon. Magic Rock - High Wire 5.50 Strong pale bitter with very good citrus hop character, full bodied and with a very fruity finish. My score 17/20. Redscar - Pier 4.50 Malty ruby coloured bitter with a nutty bitterness and a dryish finish. My score 15/20. Big Lamp - Golden Star 4.00 Very pale bitter with good hop character with citrus notes. Well balanced with a fruity finish. My score 15/20. 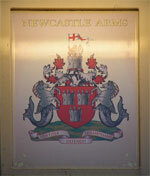 The pub is found in Newcastle-upon-Tyne, Tyne and Wear, NE1 5SE. An L-shaped pub with big mirrors on the terracotta painted walls. Look out for the photo of Alan Shearer on the wall. Local CAMRA Pub of the Year 2007. Also known as Top Arms. We have visited this pub 43 times, seen 117 different beers and tried 107 of them.